There are a number of Linux software solutions that do tethered shooting, aka remote capture and they do it well. In this article I am describing the difficulties of setting up darktable for tethered shooting with a Canon EOS 600D digital camera on Ubuntu 12.04. Plenty of people managed to do this and I meant to do the same. I was quite surprised when it did not work the way it should have worked. I am using a Canon EOS 600D digital camera as a microscope camera, because I can put its liveview functionality to very good use. Either to teach or to produce good quality micrographs. If you are using Mac OS X or Microsoft Windows you can use the Canon EOS utility to use tethering to control a digital camera with your PC. However if you like to – or have to – use a brand of Linux you will find that the Canon software does not run with Wine. Of course you could run Windows or OS X on a virtual machine, such as Virtualbox, but that became too cumbersome for me. 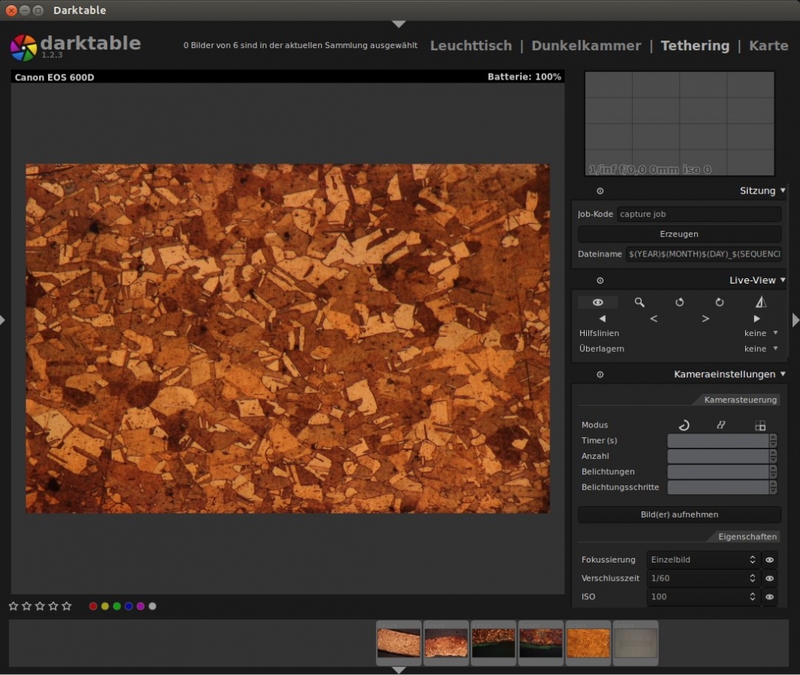 The image shows the darktable interface for tethered shooting. With Canon Liveview cameras the computer may be used to control the camera and take pictures. The image shows a section of an etched copper roof from the 18th century. These two solutions have the same effect, because they disable the same feature: It prevents gvfs from mounting your cameras SD card as a storage device. So unless you are happy with the fact the camera will not appear in your file browser any more, I would recommend the other solutions. Photo managing software should still be able to find your camera, though. Well, I hope this helps. Let me know if you found any other solutions.